On 19 August 2014, the Santa Clara City Council, by a unanimous vote, passed an Ordinance to prohibit the distribution of single-use carry-out bags including the approval and Adoption of a Negative Declaration pursuant with the California Environmental Quality Act (CEQA). The latter document declared that the bag ban will not result in a significant environmental impact. Similar to ordinances passed by other cities, the proposed ordinance would ban the distribution of plastic carryout bags at point of sale beginning 1 December 2014. Retailers may also make paper bags or reusable bags (Cloth or thick plastic bags) available for sale at a minimum fee of 10 cents. In addition, customers who participate in WIC or SNAP (Food Stamp Programs) are eligible to receive one or more paper bags at NO COST. The fees collected by the retail establishment are to be retained by the retailer and are meant to pay for the cost of implementing the ordinance (i.e. the cost of paper bags provided to customers paying the paper bag fee and the cost of free paper bags received by WIC and SNAP participants.) (van Leeuwen, Plastic Bag Ban Creates New Welfare Benefit, 2013) A retail establishment is subject to a fine for each occurrence where it provides a customer a plastic carryout bag not meeting the requirements of a reusable bag at the point of sale for the purpose of carrying purchases home. The following letter was sent to the Santa Clara City Council from Stop the Bag Ban Citizen’s Group and is reprinted verbatim with permission. The letter makes a number of important points and raises important issues that should have been discussed and addressed by the council. The letter has been formatted for publication as part of this blog article. Brackets “” denote corrections by the editor of this blog. Nowhere in the arguments for a bag ban has there been clear evidence and statistics as to any type of plastic bag problem in Santa Clara. People claim that bags are picked up during cleanup days, which is true, but virtually EVERY other form of trash is also picked up. The fact that some are picked up (along with the other trash) is insufficient to impose a complete city-wide bag ban on everyone! Candy wrappers, Starbucks cups, newspapers, tires, and mattresses are also picked up. Are those being banned? 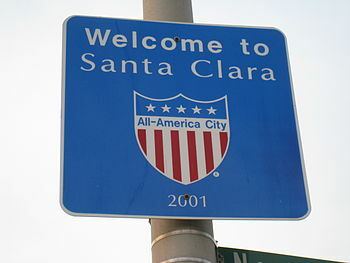 Furthermore, I drive through Santa Clara often for work, lunch, or shopping. I have yet to see any bag problem. The vast majority of the time, I can drive clear across Santa Clara and NOT SEE A SINGLE PLASTIC GROCERY BAG! Can you show us where the bag problem is in Santa Clara? Is the “cure” for this greatly exaggerated plastic bag problem to ban everyone from getting them? So now everyone must be punished for the bad mistakes of a few? Can you explain any reason why newspaper bags are not being banned? Are they not a worse offender (being thrown down by the thousands in our streets and gutters, just feet from storm drains)? And are they not MUCH more easily resolved (the newspaper carriers need only deliver the newspaper to a doorstep or the good old fashioned mailbox tubes we used to have)? Why should newspaper carriers be free to wrap newspapers in plastic bags every time it MAY rain during the day just because they are too lazy to do their job the way they used to, while you COMPLETELY BAN over 100,000 citizens from getting plastic grocery bags at the store? HOW DOES THAT MAKE ANY SENSE??? The “pacific garbage patch” is actually just small particles of hard-plastic in a certain region of the Pacific. NO PLASTIC BAGS are considered part of the “Pacific Garbage Patch”. Likely, less than 1 in 10,000 or more plastic grocery bags are littered. Do 9,999 people have to suffer because 1 person litters? There is NO WAY that every person uses 500 plastic grocery bags per year, as repeatedly claimed by bag banners. Just think about what that means for a family of 4: TWO THOUSAND per year. Really? Does anyone apply any reason to the claims? The recycling rate for plastic grocery bags is low (less than 10%) because OVER 70% OF PLASTIC GROCERY BAGS ARE REUSED BY PEOPLE, therefore cannot be recycled in a typical recycling program. REUSE IS RECYCLING!!! It actually is the BEST form of recycling! The bag banners think they are being so clever by making the paper bag fee a “minimum fee” collected by the stores, supposedly to offset store costs. But in reality it is just an OBVIOUS skirting of California Law that requires voter approval of new taxes. Ever wonder why Safeway and the California Grocers Association jumped on board the bag bans? MONEY!!! You are considering MANDATING that your citizens pay 10 cents (going to 25 cents) for a product that costs less than 5 cents. That is 100% to 500% PROFIT going directly to the stores! What kind of a payoff scheme do you have going on here? Do you know that NO city council has ever put a bag ban to a vote by the people? Bag banners will boast that 100 cities passed bag bans. That is incorrect. It is 100 CITY COUNCILS that have passed bag bans. Not a single citizen in California has voted for the bag ban and paper bag fee that you are considering. Why not? Levi Stadium does not allow bags (or even large purses) inside. Thus, if citizens CAN NOT bring in reusable bags, then is your “minimum fee” now actually a TAX??? What choice does a citizen have? Will you also enforce the bag ban rules on all of the visiting vendors at the Santa Clara Convention Center? And are you expecting people to bring reusable bags to Great America, just in case they buy a stuffed animal? As noted above, no problem has even been identified. And even if there were a plastic bag problem, why the paper bag fee? It is all about CONTROL. Is that the function of your city council? To control businesses and people in a manner in which they could choose to act if they wanted to? Think about it. NO BUSINESS IS FORCED TO PROVIDE PLASTIC BAGS, AND NO CITIZEN IS FORCED TO TAKE ONE today. So why don’t bag banners just “educate” the public and let us make the choice? Obviously, they think we are too stupid. Is that how you feel as well? Even your own city flyer on the bag ban describes follow up to gauge the effect of the bag ban by taking “surveys” at stores to check citizen behavior. That is a CLEAR admission that this is all about behavior control, and not actually helping the environment. The amount of garbage in your creeks could double, but your city workers would still be out watching citizens exit the local Safeway and declaring a bag ban a big success! There are many more reasons why bag bans are wrong, but I know your time is limited. There is plenty of information available online that exposes bag bans and asks serious, thoughtful questions. DO NOT force a bag ban on your citizens. PUT THE BAG BAN ON THE BALLOT AND LET YOUR PEOPLE VOTE! Think about it: Santa Clara could be the FIRST city in California to ACTUALLY ASK THEIR CITIZENS if they want a bag ban! At the same time, you could make the 10 cent paper bag fee an official tax, collected by the city! You could use those millions of dollars per year that your citizens will now be spending on bags for programs such as real litter control and cleanup. Why wouldn’t you want to collect the money rather than having it just as a profit for the big grocery stores??? If you have ANY questions about bag bans, please visit our website or contact us. We are willing to meet with you to discuss your questions and explain our fierce opposition to bag bans. We are NOT litterers, nor are we paid off by any plastic industry. We are private citizens who see through this for what it really is: behavior control against our will for meaningless reasons. And we actually believe that plastic bag bans are WORSE for the environment than not having them. Please spend just a fraction of the time, cost, and effort that a bag ban takes on really doing something that helps the environment and DO NOT implement a bag ban. It ignores the fact that plastic carryout bags are recycled by the In-store recycling bins at retail outlets that distribute plastic bags. This is totally separate from the companies that collect recyclable material via the curbside recycling bins. The latter sell the recycled material they process to make ends meet and processing of plastic film including plastic bags is not economical. Hence these companies send plastic film material to the landfill.